Nidhi Shah, left, current president, Ahmad Al-Saygh, newly elected president, Wiwi Sanusi Tjandra, newly elected vice president and Sarini Mapalagama, current vice president of ISC, talk about creating a more diverse committee for next year's International Student Council, Tuesday, March 8, at the ISC Office in Memorial Union. Coming to America might be a cultural shock to many international students, but Ashvin Sudhaharan, junior in open-option liberal arts and sciences and events coordinator of the International Students Council, said he didn’t experience any cultural shock. Sudhaharan grew up in Kuala Lumpur, a bustling city in Malaysia. Sudhaharan said he thinks the pace in Ames is slower than Kuala Lumpur. Many students find life in Ames is peaceful, and some are used to the quick pace and exciting lives they had. However, not many students are as lucky as Sudhaharan, who didn’t face any cultural shock. “Students find it different, especially if they are from the Asian countries where they have more conservative cultures,” said Danny Eshcol, a previous coordinator for international students’ orientation. They go through cultural transitions, he said. There are many cultures in the world, and all of these cultures have their own set of values and traditions: language, television shows, food, music, weather, communicating with other people – all are things that people find different from their own culture when compared to the American culture. It takes patience and time for one to be able to feel fully comfortable in a different environment, especially when they’ve been in their own culture for the past 18 years of their life. However, Sudhaharan said the local people help a lot as the international students are going through the changes. Sudhaharan said Iowa weather was something he had to adjust to. International students should be aware that winter in Iowa can get very cold. Students from tropical countries where it rarely gets below 80 degrees, like Singapore, Malaysia, Indonesia or Thailand, might have trouble adjusting to the cold winters in Iowa. Researching beforehand about the types of clothes suitable for the weather is highly important. International students can also seek help from multicultural associations, such as the ISU Bangladeshi Community, Indian Students’ Association, Japanese Association and many more. The International Students and Scholars Office usually plays a part in helping incoming students contact associations of their nations, in case any questions arise. It would be the best option for students to ask their fellow countrymen questions regarding the weather, as they came from the same environment and would have a better understanding of what future problems incoming students might face. Another problem students might face while studying abroad is a language barrier. “Coffee, Tea and English” is a program international students can join in order to improve their English language skills. International students have the opportunity to meet with volunteer native English speakers. This is also a good time for international students to get to know more about American culture. The International Students and Scholars Office offers a conversational English program. International students will be matched up with American volunteers. Partners will meet for one hour per week in a one-on-one setting. Other than improving their language skills and sharing cultures, the program also aims to develop friendship among participants. Other than that, there are also friendship partner programs on campus that pair up international students with Americans so that international students can practice speaking English. Making new friends is another stage international students have to go through. “Everybody coming to college faces the challenge of making friends,” Eshcol said. It makes it harder for international students as they are leaving their friends behind, Sudhaharan said. These are also the times students will feel homesick. Being in a different environment can sometimes be hard for international students, as they are far away from the things that they are used to. Eshcol said it is very important to make sure students make a routine of the things they are interested in, in the culture they are engaging. “Join toward your interest or your own culture,” Sudhaharan said. It makes it easier for international students to make new friends when they have something in common. When students feel like they are alone and helpless, they must remind themselves they are in a different country, Eshcol said. Sometimes students can feel helpless and lonely when they first arrive in a different country. It would make the transition easier for them if they expect difficulties before coming to the United States and, through those difficulties, maintain a positive attitude. International students are not only learning about a new culture, but when they immerse themselves in another culture, they learn about their own culture as well, Eshcol said. “Students will learn things they haven’t thought about their own culture, and they learn more about their background,” he said. There are many organizations that can help students feel at home. “The International Students Council always welcomes international students to drop by and ask us questions,” Sudhaharan said. Other than that, ISC provides a place for students to promote their own culture. Students can also get to know the locals because not all ISC members are international students, Sudhaharan said. 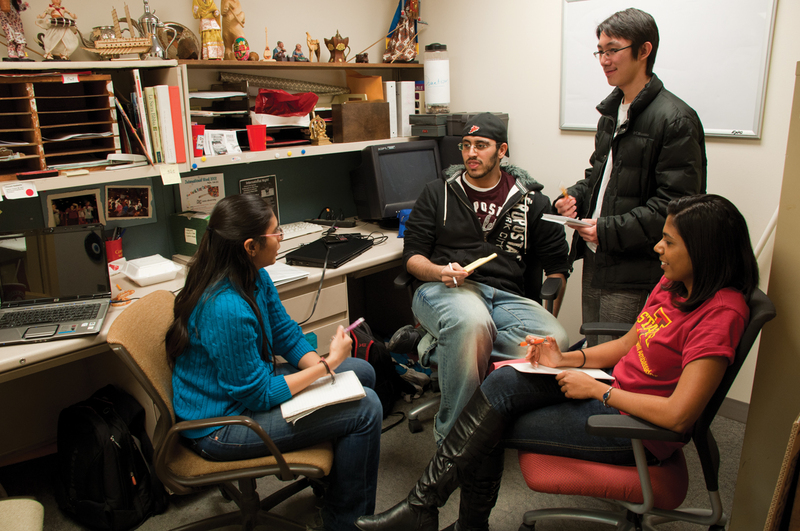 ISC also serves as a platform of communication for all members of Iowa State, especially for the students, faculty and staff. Bridges International is a student organization that helps international students in getting accustomed to the new culture through service activities, social networking opportunities and spiritual resources. Staff members of the organizations know how to deal with the problems that international students face as they have traveled, lived, studied and worked abroad. These staff members have experienced culture shock while they were abroad as well. As they’ve gone through the same experience, they understand the challenges that international students face while being in a foreign country. Students can learn more about the organization at www.iowastate.bridgesinternational.com/. American Culture Club, formerly known as American Culture Acclimation Society, hopes to help encourage interaction between international students and Americans through activities. The club provides useful information about surviving in Ames, such as places to buy textbooks, how to buy a car and introduces students to the driving laws in America. The club encourages discussions between international students and Americans, and one of its responsibilities is to help facilitate those discussions. To learn more about the club, visit www.stuorg.iastate.edu/acas/. International Friendship Connection, sponsored by Cornerstone Church of Ames, seeks to serve and support international students, scholars and their families. IFC has hosted many events that help connect international and American friends together. Fusion, a monthly event which is on the first Friday of each month, invites students to meet together to sing worship songs, learn more about God, play games and have fun. IFC also has several yearly events, including Independence Day Celebration, Hayride and Farm Visit, Winter Getaway Camp and Spring Break trips. Jack Owens started IFC in 1996 after his own experience of being a foreigner in South Korea. He remembered the support and understanding that he received from the locals while he was adapting to the new culture. He started IFC so that he could do the same for others who are going through a similar experience. For more information, visit the website at www.ifcinfo.com.